Looking for a gripping, bite-your-nails thriller that will keep you up late into the night? Before I Go To Sleep by S.J. 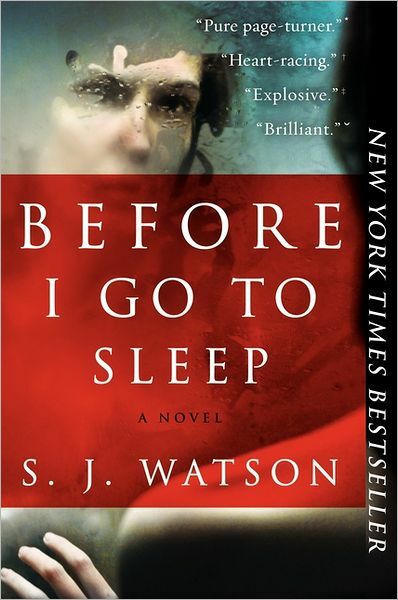 Watson is just the book you need. It stars Christine, a woman who is suffering from memory loss due to a bad accident in her past. Each morning, she wakes up with no idea who she is, and when she stumbles upon a diary she’s written, she learns that she may not be able to trust the one person who, day in and day out, informs her of her identity. This book is edge-of-your-seat good, and we’re thrilled that it’s now in paperback. What would you do if you couldn’t remember each day that came before today? If you woke up each morning, terrified because you didn’t know who you were, or who the man sleeping beside you was? That unimaginable situation is what Christine must face each and every day — and just as every day, Christine’s husband, Ben, must explain who she is and why she can’t remember anything. Christine suffered brain trauma in an accident years ago, and ever since then, she has been unable to retain short-term memories, or to transfer them to the long-term memory area of her brain. All she can remember is what she’s accomplished in one day — and that is wiped clean when she falls asleep. Christine marvels at what Ben has had to deal with over the course of the past few years, at how devoted he is to her. That is, until Christine finds a diary — one that belongs to her, though of course, doesn’t remember writing in it. The first three words in it? “Don’t trust Ben.” All of a sudden, the little Christine thinks she knows about herself and her world is turned upside down, as she has no idea what is going on around her. Unsure whether she can trust her own words, Christine connects with a doctor she’s supposedly been working with over the past few months. As she tries to reconstruct her memories and determine what is true and what is false, she must face difficult truths from her own past. After all, one of the hardest things in life is not knowing whether you can trust yourself.